The Swedish company Trustly has been an innovative online payments solution for over a decade. It has led the industry into a new age with its brand new service Pay N Play which allows players to play at casinos without a registration. Trustly works directly with banks and is therefore highly secure and trustworthy. It is most commonly described as an e-wallet but Trustly’s services far exceed that title. In reality, it has tons of useful features for both players and operators, such that are unique to the market. Its partners list among many others Skrill and PayPal. It currently operates with the banks of 29 European countries. The advantages of Trustly are plentiful – it offers security, speed, convenience, all with almost no fees. As we already mentioned, because Trustly operates directly with banking institutions, it needs to comply with the latest security policies. This banking option is secured with SSL encryption and various other fraud countermeasures. Speed can vary depending on which of Trustly’s services you have picked. Usually, all transactions that are up to Trustly are instant. That is why a large portion of gamblers online utilize it – it is like making a bank transfer but without the associated waiting time of about 7 business days. On top of that, it is also far more secure than a direct bank transfer. Trustly is an incredibly convenient payment method because there is no lengthy registration process nor an authentication one. All you need is your bank to support online banking and for you to have taken advantage of that service. Then, Trustly will simply ask you to select your country, bank, and then log in with your online banking credentials. It is that easy. However, Trustly is an innovator and did not stop at that. Instead, it launched its Pay N Play service. This way players are not required to have ever used Trustly before, they only need to have online banking. Then, the funds immediately appear in the casino account which is created in the background. 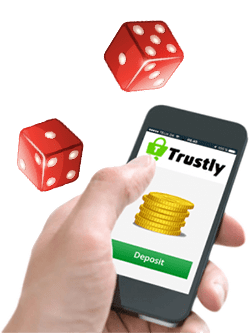 This way players do not need to register at casinos as the information required for an account to be created is provided by Trustly. Of course, that excludes sensitive information. Unfortunately, this service is available only to players with bank accounts in Sweden, Finland, or Germany. Because of different laws and regulations, Trustly cannot offer its Pay N Play service worldwide yet. Hopefully, that is about to change. Additionally, as we already mentioned, Trustly itself is also not available worldwide but in only 29 countries in Europe. That limits its convenience and overall usefulness. Therefore, not all casinos are likely to include it in their list of available payment methods. There is also the fact that Trustly requires players to have activated their online banking service. If a player wants to play immediately but needs to activate the service first, it will take a fair amount of time. Of course, this depends on your bank but it usually still takes at least a day for the whole process to be completed. While Trustly does offer customer support in the forms of an FAQ page and a form you can fill out which is to be sent to their e-mail address, it does not offer live chat. Among the frequently asked questions on the page, players can find a lot of answers but not all. Then, they can contact support through the form on the website but it will take some time to get a reply and it will certainly not be instant. This is a disadvantage given that most reputable payment solutions nowadays offer live chat as it is the most useful feature when it comes to helping players. 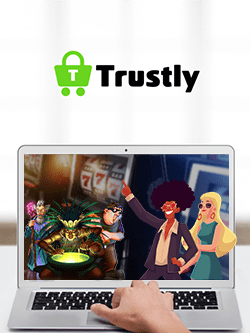 It is extremely easy to use Trustly for transactions in online casinos. Deposits are instant and, if the casino allows it, withdrawals are also instantaneous. In any case, they do not take as long as a bank transfer. It works just like any other payment method you may wish to deposit or withdraw with – you first go to the cashier page, then select Trustly, then enter the amount you wish to deposit or withdraw, and after that you will be taken to a secure page where you will be able to enter your online banking credentials and confirm the transaction. However, with another one of Trustly’s services, one we already mentioned, things are quite different. We are, of course, referring to Pay N Play – this is the service that has made no account casinos possible. This service allows players to simply deposit and start playing without the lengthy and tedious registration and authentication processes. When it comes to limits for deposits and withdrawals things might vary a lot. This is once again because of both casinos and banks. Their policies differ largely, so make sure you check what the minimum and maximum transaction amounts are before registering. One thing is for sure – Trustly is definitely suitable for online casino transactions. Unlike other payment methods, Trustly has fully embraced the fact that it is useful to so many gamblers. After all, that is the exact reason why the company developed Pay N Play, which was in itself a development in the industry. Trustly is an innovator and the company is clearly interested in the gambling industry, so we can expect even better things to come. Trustly does not actually charge players fees for deposits or withdrawals at online casinos. However, it is worth noting that your bank might. You can check with it to make sure that you are aware of all fees applicable, prior to using Trustly for such purposes. Additionally, some casinos also charge fees, though nowadays that is not considered a very user-friendly practice. So, you can easily find a casino that does not charge its players any fees for depositing or withdrawing. All fees associated solely with Trustly depend only on the user’s banking service. A large portion of banks charge fees for online banking transactions. Regardless of whether you are using Trustly’s regular services or Pay N Play, there might still be a fee applicable. As we mentioned, Trustly processes payments instantly if the transaction’s speed is only dependent on it. Withdrawals are processed just as quickly which is greatly appreciated by players. Once a player has gone through the process we described earlier, the funds transfer should be complete immediately. Again, this depends both on the casino and bank that a player is using. In most cases, Trustly deposits and withdrawals are both instant. Players will notice that their funds will appear in their casino accounts right away. When it comes to withdrawals, Trustly is just as fast and so, players will be able to see their winnings appear in their bank accounts immediately. This is thanks to Trustly’s revolutionary service called Payout Express. It is just as easy to use Trustly on mobile as it is on desktop. You can make an account on mobile as well. This can be done on the mobile version of the website which is highly adaptive and intuitive. It offers great cross-platform compatibility, making Trustly available on all browsers and operating systems. Additionally, Trustly also offers apps for Android and iOS users. You can easily find and install it as it does not take up a lot of space and is light on your processor. All you need to do is log in and you will be able to view your balance wherever and whenever you want. Of course, it is just as easy to make a payment using Trustly on mobile as it is on desktop. All you need to do is follow the instructions on your screen and the transaction will be complete in no time at all. So, this payment method is suitable for players who prefer mobile casinos as well. Trustly offers high-grade SSL encryption every step of the way. Every single page of its website is highly secure but most of all the page on which you need to enter your online banking credentials. This type of encryption, specifically 256-bit SSL encryption, is nearly impossible to break. It would take years to crack it if anyone even manages to do it at all. So, this way, your information remains mostly in the hands of your bank. The information Trustly keeps about you is only so that you are recognized by its system. No one can use that information to break into your online banking or bank account, let alone make a withdrawal or drain it. Thanks to Trustly, such confidential data is never revealed to third-parties. A way to know for sure that Trustly is a reliable payment method is that it is regulated by the Swedish Financial Supervisory Authority. It is officially recognized as a Payment Institute. It is under complete supervision from this highly respected financial authority, so the company simply cannot misuse your data. Trustly is an online payments facilitator that can also be used as an e-wallet. It allows players to make financial transactions directly to and from their bank accounts without the associated processing time. Is Trustly a reliable payment method? Yes, it will consistently facilitate your transactions in a timely and convenient manner. Of course, that would be possible only if you use the same online casino and online banking credentials every time. If not, the speed, limits, and fees of the service will vary. If you are currently located in one of the 29 countries in which Trustly is available then yes, most certainly you can. If you are located outside of Europe, then you, unfortunately, will not be able to use Trustly’s services. Can I use Pay N Play? Pay N Play is currently only available to players from Germany, Sweden, and Finland. So, if you are located in one of these three countries and have an online banking account, then yes, you will be able to use Pay N Play. Are there fees associated with using Trustly? Fees may be charged by your bank or the casino you have picked. Trustly itself is a cost-free service and does not charge its users any fees. Do I need to create an account to use Trustly? No. All that is required for someone to use Trustly is to have activated their online banking at one of the supported banks. Players only need to enter their online banking credentials and the sum they wish to deposit, then the funds will immediately appear in their account.